No plans for the upcoming weekend other than consciously staving off spontaneous combustion from the privacy of your own air conditioned home? You might want to check out the “Winter In July” event taking place this Saturday (7/17) morning at the Phoenix Zoo. Between the hours of 7 – 11 AM, the zoo will do its darnedest to make you forget that it’s hotter than molten lava sunscreen by importing 25 tons of man-made snow for kids (and the young at heart) to play in, and an additional 35 tons for the animals. Observe special feedings around various cold concoctions for the big cats (follow the link below for specific times). Watch the elephant get a hose-down courtesy of the Tolleson Fire Department. Witness with morbid fascination as marmots are cryogenically frozen and sold at the concession stand as otter pops (I kid, I kid. Don’t call PETA). A slip-n-slide will be in full swing, along with the splash pad and water cavern play areas. Sweat your way through another Saturday if you like, but that’s on you, bub. For additional information, schedule of events, directions and more, visit the Phoenix Zoo online. Hope to see you there. I’ll be the guy throwing snowballs at the Komodo dragon while my kids gleefully club each other unconscious with giraffe-shaped icicles. Good times. As part of my continuing series of things to do in and around Scottsdale, Phoenix and Paradise Valley, Arizona, today’s edition is devoted to the Phoenix Mountain Preserve. As the Valley has been beset by rapid expansion and development, political forces have been at odds over the preservation of our native land. 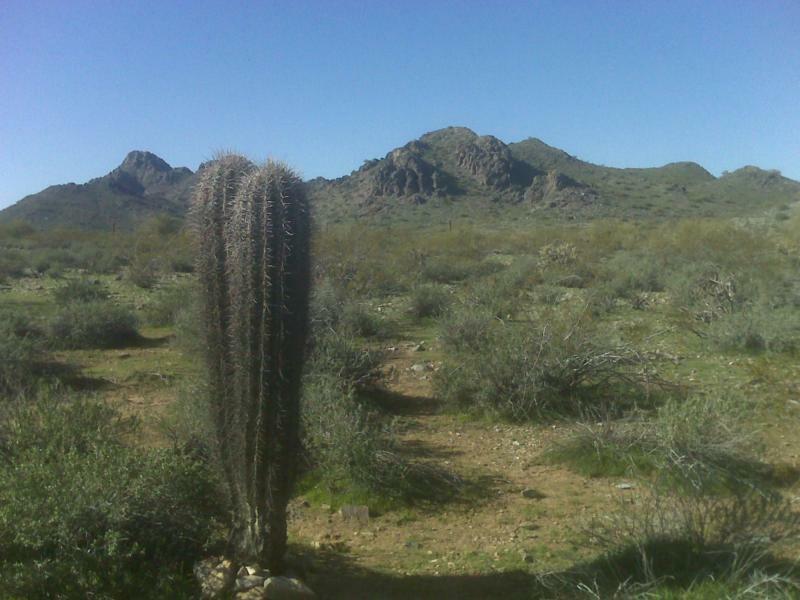 Victories for conservationists have produced a series of preserved mountain areas within the greater Phoenix metropolitan area. Encompassing approximately 23,500 acres (non-continuous) in total, and open to the public for hiking, mountain biking and horseback riding, the preserves offer an amazing opportunity to experience raw Arizona without leaving the confines of the city. There are seven primary mountain preserve areas in Phoenix: Lookout Mountain, Shadow Mountain, North Mountain/Shaw Butte, Stoney Mountain, Stoney Mountain South, Piestewa Peak (formerly Squaw Peak) and South Mountain. 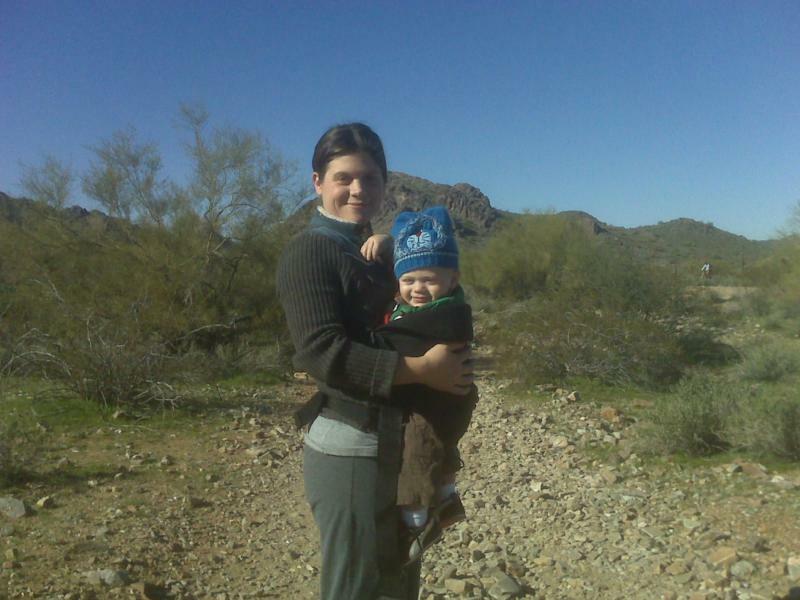 This past Sunday, I took the family to the Piestewa Peak preserve area. Instead of accessing the preserve from the South where there is a direct route up the peak, we decided to stomp around the open area to the North. 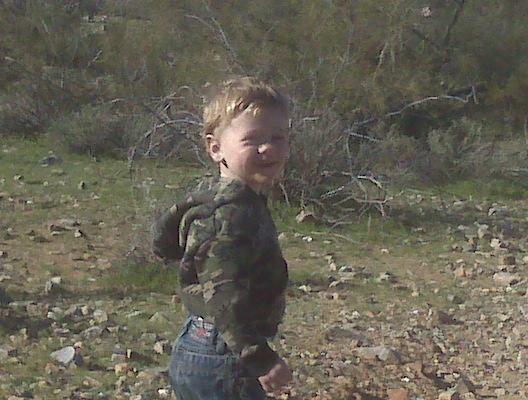 Not quite ready for mountain climbing, the boys were much better suited to scampering along the relatively flat trails. 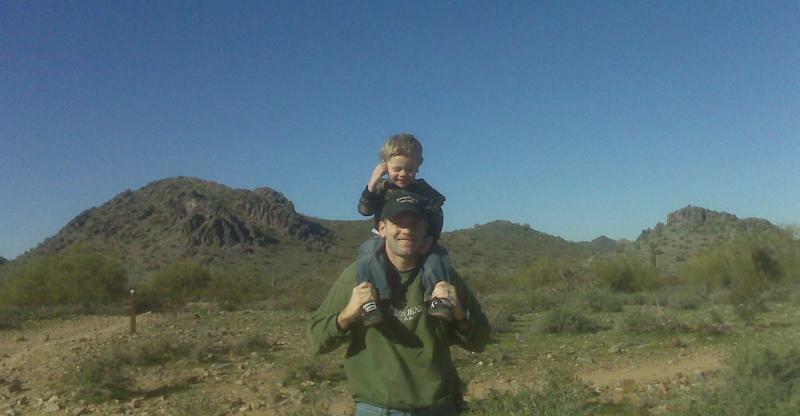 On this day, the desert was surprisingly green and vibrant with undergrowth. With sunshine on our faces and just the slightest nip in the air, it could not have been a better morning for communing with mother nature. Look, there goes a group of middle-aged mountain bikers. Up ahead is a gaggle of high school girls chattering away about nothing and everything. To my left is a couple with three exceedingly happy Labrador Retrievers. In the distance to the right, I can even see the silhouette of a man on horseback. Yet, despite the traffic, I do not feel imposed upon. The preserve so open and expansive, the mountain vistas so spectacular, that it never feels crowded. Quite the contrary, we trade genuine smiles with each person we encounter. Eager for the chance to express feelings of contentment with fellow revelers. Every eye sparkles. While fruitlessly trying to teach my toddler to identify a “mountain” and “cactus,” I can only laugh as he instead opts to inspect every single rock at his feet. Trust me when I say that is a lot of rocks. An hour later, tired but refreshed, we found our way back to the parking area. The paved parking lot which I should note was not paved the last time I utilized this point of entry. In fact there were no restrooms when I was here last either. What does this tell me? That it has been far too long. When you need to step away from the rat race, don’t forget this haven is only minutes away. 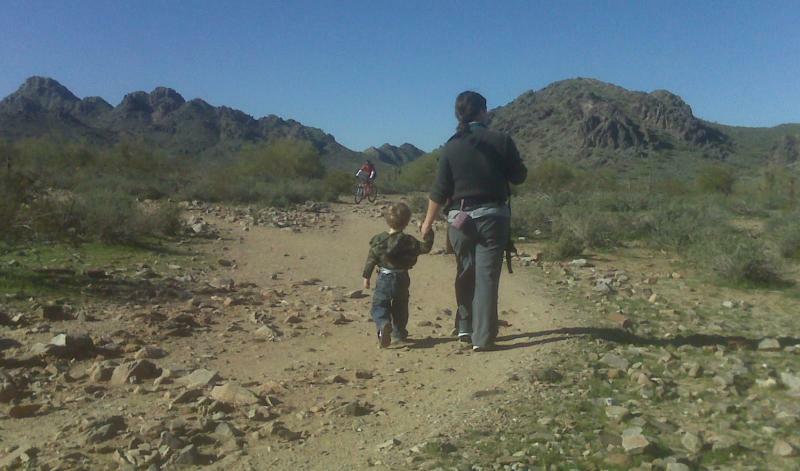 For access to this part of the Phoenix Mountain Preserve, go West on Shea Boulevard from Tatum. Follow 40th Street South from Shea until it terminates in the public parking area. Leave your worries with your car, and enjoy an enchanting day in the mountains.